To kick-start this returning series of memoirs, I thought I'd look back at what remains the most exhilarating few days of birding I've ever been fortunate to enough to experience across Britain and Ireland. Every birder has their own, individual 'ideal' within birding — be it the successful twitching of a mega, or bashing bushes during an autumn fall on the east coast. Mine happens to be battling around windswept western Ireland in early to mid-autumn, preferably among the remnants of a hurricane, looking for displaced Nearctic waifs. At this time of year, the birds unfortunate enough to get entangled in transatlantic weather systems are primarily shorebirds, though occasionally the odd duck or, if you're lucky, passerine, might also appear. The success of a visit is entirely determined by the prevailing weather conditions — the uncertainty surrounding this alone brings great excitement as each September trip draws near. Sometimes, 'Indian summer' conditions and a stubbornly prominent Azores high make a September weekend in Ireland fit only for a spot of sunbathing. The birding is slow, and you're left reliant on a long-staying Ring-billed Gull to salvage the weekend. However, in other years, the North Atlantic tends to be a bit 'messier'. It is these years when, keeping a close eye on the synoptic charts in the days ahead of the journey out west, optimism cautiously begins to grow. Such optimism enveloped Oliver Metcalf and myself in early September 2011. 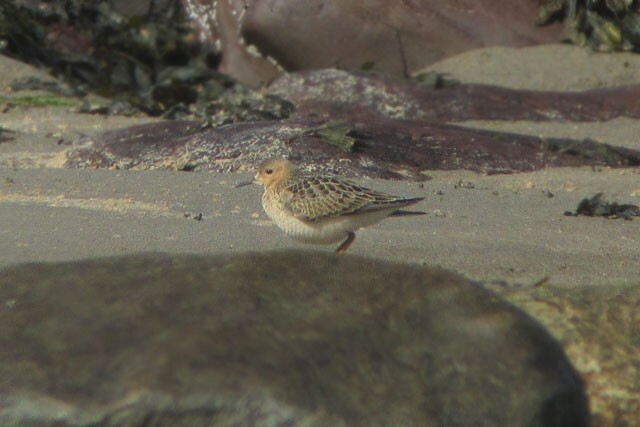 Following a reasonably successful first venture out to Achill Island (Mayo) in mid-September 2010 (we'd found Buff-breasted and Pectoral Sandpipers and, importantly, got a good feel for the island in the process), we had nearly a week in Mayo pencilled in from 18th onwards. Already by the second week of the month, the remnants of Hurricanes Irene and Katia had whipped up some outstanding birding nationwide — Nearctic shorebirds were appearing in excellent numbers, early highlights including Solitary Sandpiper on Scilly and Greater Yellowlegs in Cornwall; brilliant seawatching had included thousands of Greater Shearwaters; and the first Red-eyed Vireo of the autumn was early on Scilly. Furthermore, deciphering land-sea borders on forecasted synoptic charts was proving difficult due to the sheer density of isobars carpeting the North Atlantic — needless to say, we were rather excited. 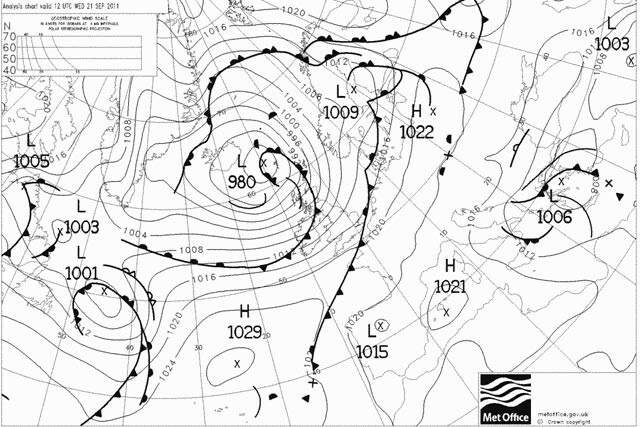 The synoptic chart for 12:00 on Wednesday 21st September 2011 — strong westerlies! A calmer period on 16th–17th saw a spanner thrown in the works. First up, a Northern Waterthrush was found creeping around Lower Moors on St. Mary's — a bird that I'd seen on Cape Clear in 2008 but something Ollie needed — and then a Black-and-white Warbler was unearthed in the same place just hours later! Frantic rearrangements saw us heading down to Cornwall on the Sunday evening , rather than boarding the Holyhead ferry. We planned for a day on Scilly. Ireland would have to wait for now. As it turned out, Monday 19th proved a great day of twitching — proper 'fill your boots' time. We started with a Lesser Yellowlegs at Drift Reservoir at dawn, before catching the Scillonian over to St. Mary's where Black-and-white Warbler, Solitary Sandpiper, Red-eyed Vireo and Blue-winged Teal were all enjoyed greatly. It never ceases to amaze what you can fit into the four hours the boat allows on the islands! Back in Penzance, it was soon obvious that the long drive to Pembroke for the overnight ferry to Rosslare wasn't going to be a problem — adrenaline levels had rocketed after a manic day, and the synoptic charts brought more exciting news: the remnants of Hurricane Maria were going to crash into western Ireland within 36 hours. All we had to do was get there. After a relatively calm ferry journey we found ourselves greeting the dawn at Lingstown reedbed, at the enchanting Tacumshin Lake. A few Hen and Marsh Harriers later, our quarry suddenly appeared — the juvenile Pallid Harrier, floating nonchalantly over our heads and giving stunning views in the process. A great start to the day but, despite the lure of the nearby lake and the inevitable cast of American waders that would be on show, we decided to head west and get to Mayo as early as possible. Further temptation came just an hour later as we learnt of a Hudsonian Whimbrel down in Cork but, once again, our bird-finding instincts won through and we unanimously decided to continue northwest. Stops at Shannon Airport Lagoon and Rahasane Turlough proved fruitless, so we powered on and had reached the southern coastline of Clew Bay by early afternoon. Our plan of attack was to tackle some of the loughs and beaches in southernmost Mayo before working our way up to Achill Island by evening. Turning north off the R378 in Louisburgh, the sense of anticipation was almost overwhelming, even though our first site, Carrowmore Beach, just north of the town, was no more than peripheral and speculative — after all, as far as we know, it had never previously hosted any Nearctic waders. On stepping out the car, it was quite clear that the wind had intensified; though it was a sunny afternoon, the westerly was touching gale force at times. Thus it was fitting that one of the first birds I clapped eyes on was instantly recognisable...small, bright yellow legs, overall creamish-buff colouration and a cute little face — bloody hell, that was easy: Buff-breasted Sandpiper! Shouting Ollie over, we enjoyed as good views as were possible in winds that routinely threatened to blow tripods over. Clearly a fresh arrival, the bird was very alert and was not associating with the local Ringed Plover flock. The feeling of relief was intense — the long journey west had already been justified. What a start! Buoyed with success, our next port of call was Roonah Lough. Too much water there, so we continued south to Corragaun Lough — a fantastic mix of white, sandy beach, tidal, mud-fringed lough and wet machair that is utterly primed for hosting Nearctic shorebirds. 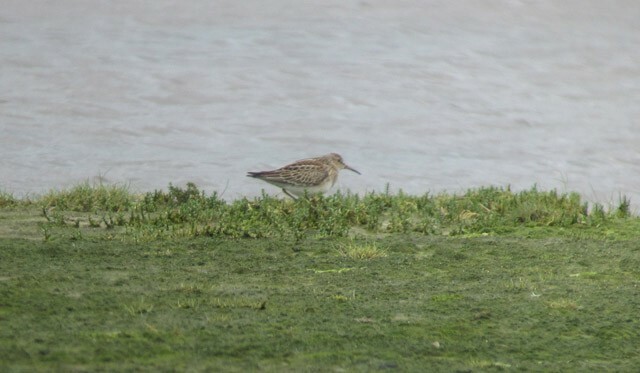 The site had already hosted a Buff-breast earlier in September and, over the weekend, Richard Bonser had added an adult White-rumped Sandpiper. 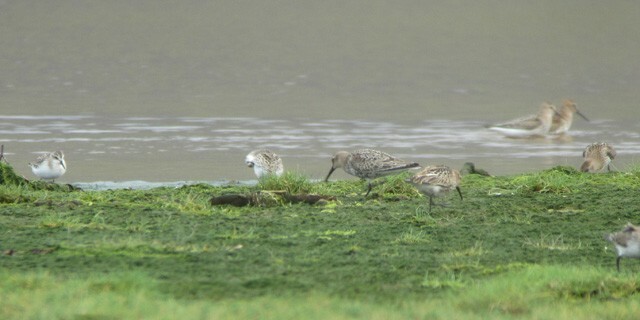 Around 25 Dunlin were present on our arrival with singles of Little Stint and Curlew Sandpiper. Rich's White-rumped was also still in the mix and, within minutes, a fresh juvenile Pectoral Sandpiper flew in to join the flock — things were getting better and better! Soon afterwards, a further 20 or so Dunlin arrived from the direction of the beach, bringing a couple of stints with them. We assumed they were more Little Stints but, on landing, they looked really quite monochrome. 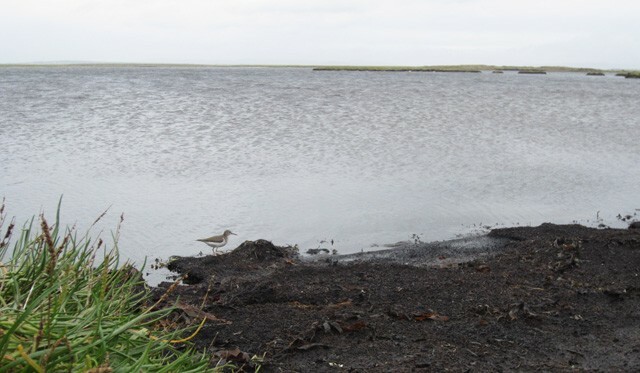 It was at that point we realised just how serious the prevailing systems must have been for displacing vagrants: the birds were juvenile Semipalmated Sandpipers and, in a matter of a couple of hours and with no real effort, we'd already found four individuals of three Nearctic species! I think it must have been about then that we went into headless chicken mode. Delirious from an acute lack of sleep and extensive travelling over the past 48 hours, we raced around Clew Bay to Achill with enough daylight left to give the golf course at Keel the once-over but, in the increasingly windy conditions, our efforts were in vain. There were no waders present whatsoever, let alone anything of a North American flavour. Still, it had been a whirlwind first afternoon and with the remnants of Maria forecast to go through overnight, anticipation for the coming few days was at fever pitch. Overnight, the weather had turned pretty serious. 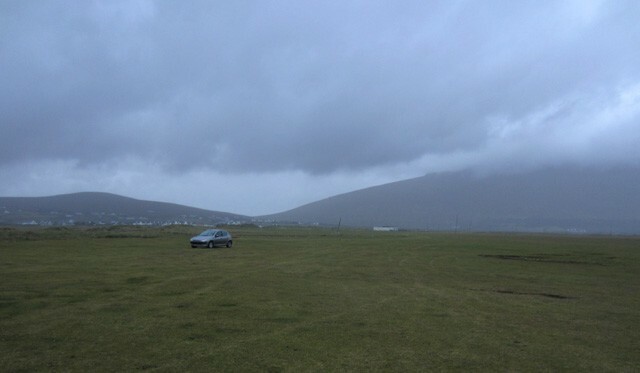 The leading edge of Maria smashed into Achill and made for a somewhat bumpy night's sleep in the car at Keel. As we rolled out of the car at dawn, we were greeted by a southwesterly that must have been gusting well over 50mph — it was hard to stand up, let alone raise your binoculars (forget the telescope!). 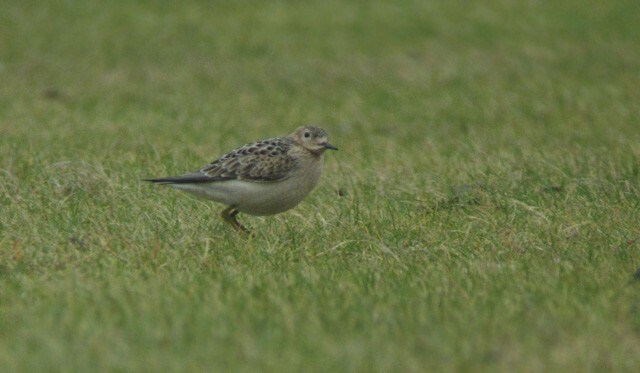 Rich Bonser had found two Baird's Sandpipers on the golf course on Sunday, so we battled our way into the gale towards the area where he'd last seen them. The gale mercilessly tossed a Ringed Plover inland as we unwittingly disturbed it and, almost immediately after, a medium-sized brown wader was blown over the shingle bank of the beach and right past our feet. It called with a "che-wit" and landed no more than twenty metres away. Bins up, confirming what we already suspected — it was a juvenile American Golden Plover! Remaining there only seconds, it got up again and was blown away inland, over the golf course — as with yesterday's Buff-breast, its behaviour suggested that it must have just come in off the Atlantic. Now fired up, with the overnight cobwebs well and truly blasted away, we started out on a lap of the golf course, locating one of the Baird's Sandpipers sheltering with Ringed Plovers in the wake of the shingle bank along the seaward side and, on the way back, a juvenile Buff-breasted Sandpiper flew in to join the group! Things were getting better by the minute. 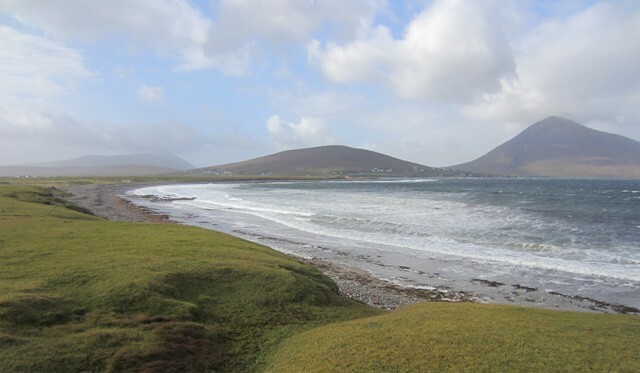 Thrilled that we'd already added two significant finds to our total before 09:00, we headed purposefully up to the far northeast of Achill Island. 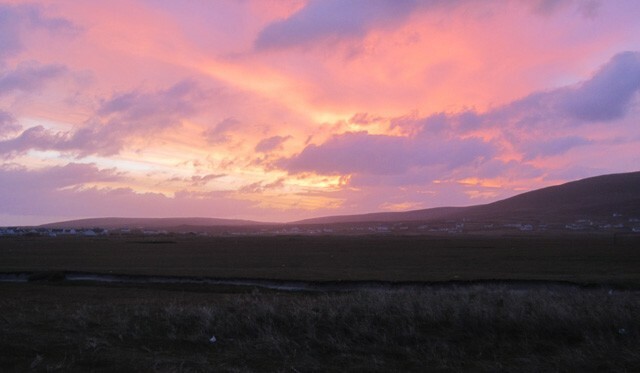 In 2010, the machair north of Tonatanvally had been the island's hotspot. Alas, there was no repeat despite an extensive search of the area on foot, so we moved around to nearby Sruhill Lough. From the road on the north side the drake Black Duck was quickly apparent, but it was a flock of waders that drew our attention. I quickly called to Ollie that I could see a couple of Little Stints distantly among the Dunlin near the lough's outflow. Clearly it was worth walking out there to scrutinize the flock more closely, so we parked up the car and headed along the coast. Closer views established that there were four stints present, but I soon had a hunch about their identity — one looked like a Semipalmated Sandpiper, but then each of the other three looked pretty similar to the first. It then clicked. 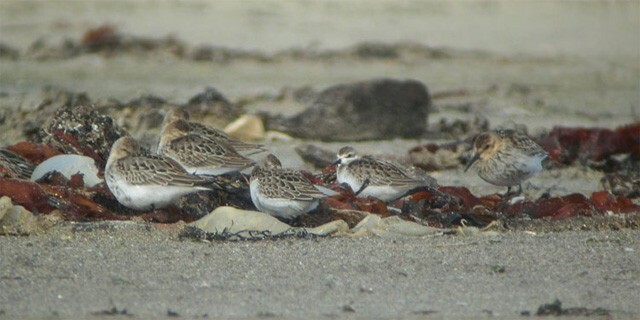 The four Little Stints were all Semipalmated Sandpipers! By this point we were in a total trance — it really felt like we'd ascended to seventh heaven and made ourselves comfortably at home. The rare bird finding was becoming metronomic. It wasn't even difficult — the birds (and there were plenty of them) were simply there, waiting to be discovered. The sporadic rain and the gales paled into insignificance. I fired off some record shots as Ollie casually called out that a juvenile Sabine's Gull was flying around over our heads with a group of Arctic Terns. Things were starting to become a little surreal. To bring ourselves back down to earth a little, we tried searching for passerines in the valley at Doogort. However, it proved a little too windy so we returned to Keel golf course, where our American Golden Plover had strategically positioned itself behind one of the few large rocks in the middle of the course, catching up on some much-needed sleep. With much of the afternoon at our disposal, we decided to leave the field of dreams and head back around Clew Bay to some of the sites we'd checked the previous afternoon. 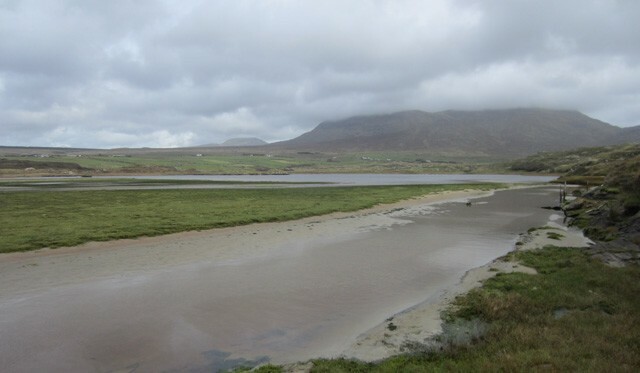 The harbour at Mulrany, just before the Achill Island turn-off, has promising-looking habitat that has never really produced much save an Elegant-type Tern back in October 2001. That all changed within minutes, though, as we picked up yet another juvenile Semipalmated Sandpiper among the small numbers of congregated Dunlin and Ringed Plover. We even let slip "why another Semipee? Why not something else?!" — talk about ungrateful, but by that point our standards and expectations were well and truly detached from reality! Following a quieter few hours during the previous afternoon and evening, Ollie and I were able to collect and re-compose ourselves for the Thursday. The wind had been forecast to drop — slightly — and our sights were set on passerines. A dawn slog around the golf course produced just three waders; slightly surreally, the trio consisted of yesterday's AGP, Buff-breast and the Baird's all seemingly palled up — 'tight', as an American might say. 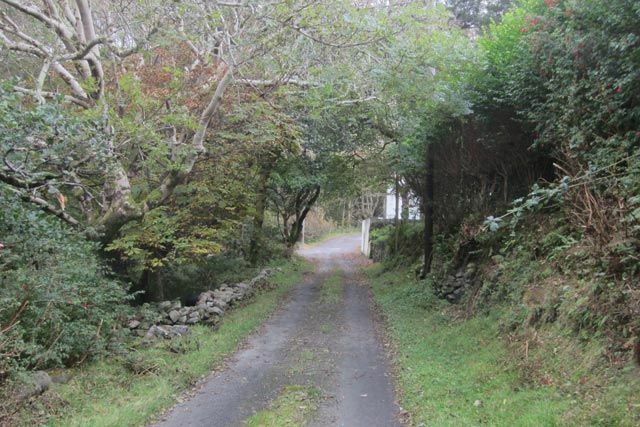 A few hours wandering around Dooagh and Keel produced precious little in the way of passerines, though a Yellow-browed Warbler was heard calling in the impressive-looking 'Art Gallery Garden'. The sheltered valley at Doogort produced little more than a couple of Chiffchaffs, though the area is very difficult to cover in a short space of time; wandering around here simply left us thinking that so much must have been missed here over the years. One of the more bizarre finds of the week (at least in terms of circumstances) then came as we headed towards Sruhill Lough. 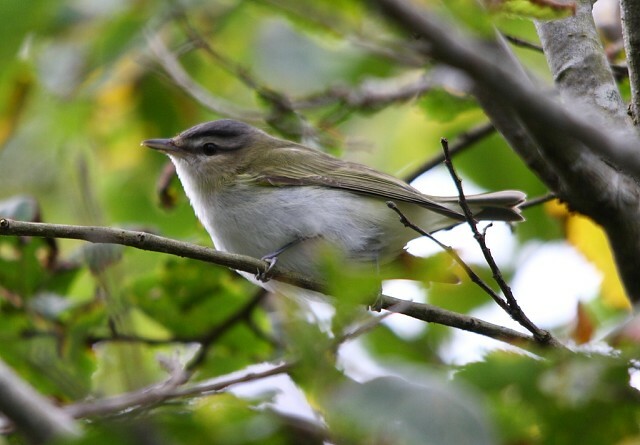 Driving through Dooniver at 70kph, both of us instantly recognised the call of a Yellow-browed Warbler as we passed through a belt of conifers — grinding to a halt, we then enjoyed some excellent views before it flitted off and away towards the lough! On the lough itself, the four Semipalmated Sandpipers and Black Duck were still in evidence, while Ollie expertly picked up a juvenile Red-necked Phalarope bobbing about — an excellent record for western Ireland and, perversely, probably one of the better finds of the trip! 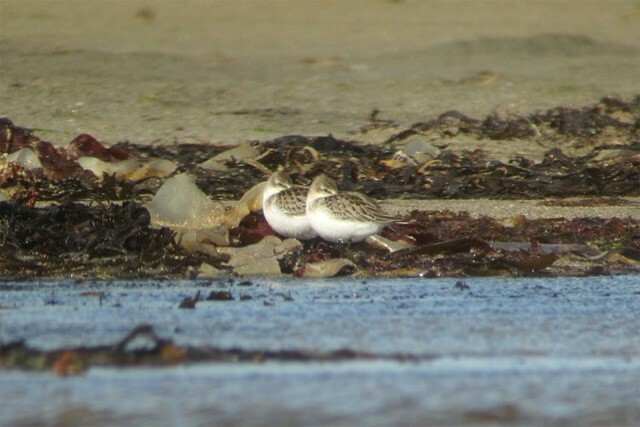 We ended the day back at Mulrany harbour, where the previous day's Semipalmated Sand was still in evidence and had, quite sensationally, been joined by a second. Though by no means complacent or unappreciative, the astounding events of the past 48 hours had set the bar so high that, rightly or wrongly, finding new birds had become something of an expectation rather than a hope or wish. We simply shrugged it off and kept searching. That said, watching the birds feeding as the light began to fade, we could only reflect on what had no doubt been the most exhilarating period of rare bird finding either of us had ever experienced and, with that, we got ourselves settled in at the Achill Sound Hotel after dark for a few pints of Guinness and a hearty fish and chips. 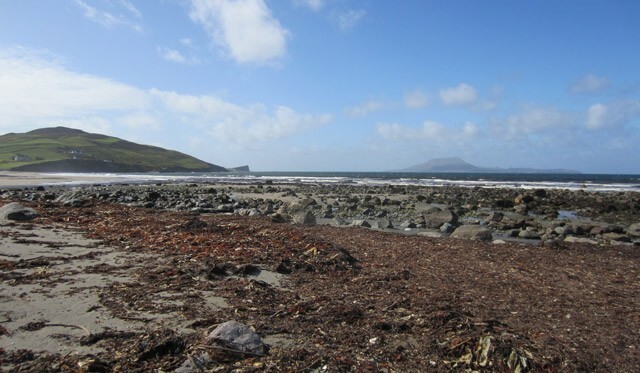 The wind had picked up again by the following morning, though it had more south in it than anything; we knew the optimal period for finding fresh shorebirds off the system had probably passed, but we remained optimistic that further rarities were present on Achill for the finding. And so it proved. After hammering many of the sites around Keel and Doogort for much of the morning with relatively little success apart from an exhausted Arctic Tern and the continuing Baird's/Buff-breast duo on the golf course, we ended up back at Sruhill Lough. An immature Peregrine frustratingly scattered all the Calidrids on arrival, though two Semipees were still present, as was the Black Duck and assorted hybrids. Then, on scanning the far bank of the lough, I noticed an Actitis sandpiper cautiously picking its way among the rocks. At 500 metres, the bird was impossible to identify with confidence so we decided to pick our way around the shoreline to obtain closer views. Stopping halfway round, the bird was still distant although features were discernible: yellow legs and a distinct ivory wash to the bill base. We were both pretty confident about what it was, but still needed to get closer. When we arrived in the area where it had been feeding, there was initially no sign until — crikey — there it was, feeding unconcernedly just a few metres away: as suspected, a stunningly fresh juvenile Spotted Sandpiper! 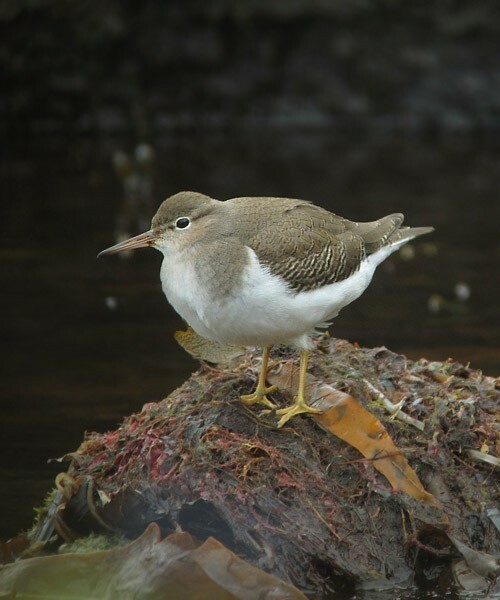 'Bird in Habitat': the Sruhill Spotted Sandpiper as it passed within just a couple of metres of where we lay. For the next hour or so, we lay around, watching the sandpiper make its way around the lake margins: the perfect way to conclude a breathless few days out in the 'wild west'. For me, this sort of experience is what birding is all about: being able to enjoy intimate views of a vagrant bird with a desolate yet beautiful backdrop such as that provided by the mountains, moors and bays of County Mayo. The Spotted Sand was the thirteenth Nearctic shorebird we'd found in four days, a brilliant return for the hours of work we'd put into routinely working a series of likely sites on a daily basis. 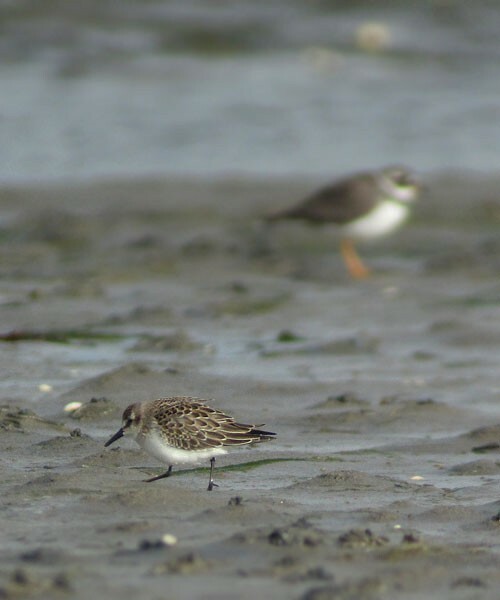 Similar tactics down in Kerry were working wonders for Dan Brown and a team of 'Punkbirders', who were having equal luck and went on to find bigger birds in the form of Least Sandpiper and Semipalmated Plover in the following days. Though it was clear that we had been part of something special at the time, it is only as the years pass that we have appreciated just how perfect the weather conditions — and their timing — had been. Though I wouldn't go as far as to say it won't happen again (it will! ), it's going to take a great deal of good fortune to strike it right in such a way — we'd been blessed by some fantastic (at least from a birder's perspective!) storms that had followed near-perfect tracks across the Atlantic. It's really quite difficult to sum up your thoughts and feelings in periods like this. Intense excitement and anticipation really gets the adrenaline rushing. It may sound silly, but you definitely work yourself into a zone where nothing but birding matters; there's a definite buzz and you feel ultra-switched on. I guess anyone who's spent time on Shetland when a southeast is blowing and the rain is falling will know what I mean: in many ways, it's merely a natural expression of the human hunting instinct. 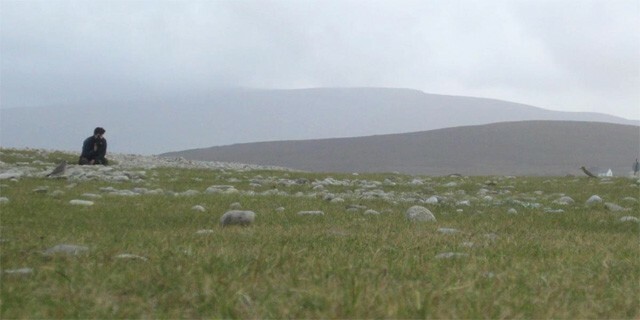 Doogort Valley, Achill Island — how many undetected rares in here over the years? (Photo: Josh Jones). And so our annual pilgrimages to western Ireland each September continue. With just a couple of mediocre transatlantic systems preceding our trip, 2012 was never going to replicate the previous year, though we did find a juvenile American Golden Plover in more-or-less exactly the same spot as in 2011. A couple of Pectoral Sandpipers added to our belief that there is always something to be found if you put the time in, even if conditions are suboptimal. Based on my experience of annual 'wadering' trips since 2008, I'd rate the 2012 trip as "average to good", whereas 2011 was simply off the scale. The weather conditions in the North Atlantic this week look average at best, but I'm off to Stansted now for an evening flight to Shannon, and this weekend I'll be back on Achill. It doesn't look as though it's going to be 2011 vintage but, as a mate always says to me, you have to keep the faith with the wild west. Many of the sites described in this article are covered in Josh's book Birding Western Ireland, which is available in iBook format from www.birdguides.com/estore/p-979-birding-western-ireland-ibook.aspx.